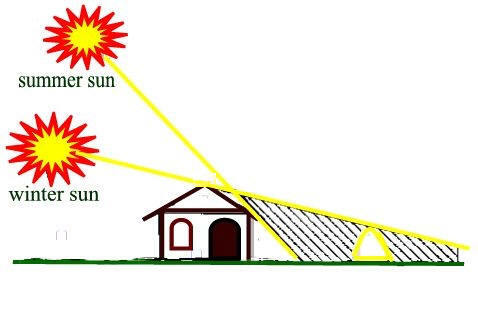 Light:Just as in planning a garden, greenhouse growers should be very aware of changing light patterns throughout the seasons. Even in an open field, one needs to be aware of orientation to the direction of sun. Intelligent site planning in a backyard can save a lot of energy and may allow growers the edge that will make their plants thrive. Foundation and site drainage - Consider the type of foundation on which the greenhouse will be installed and consider the drainage and elevation of the site. The drainage of the site is crucial. Always, factor in what foundation requirements are for each model and type of greenhouse. Energy issues - Your greenhouse will need energy input to power fans, heaters, etc. Thinking out the distance from your power and water source is a very necessary first step in a friction free greenhouse building process…. Evaporative coolers work by pushing or pulling air through a water-saturated pad and into the greenhouse. They are most efficient in dry climates, but work in humid tropical climates as well. Misting systems with natural ventilation are also a viable option for cooling the greenhouse in some climates. I am going to break down greenhouse coverings into three basic material groups: polyethylene film, polycarbonate, and glass. Each has advantages and disadvantages. Many growers use a double layer of poly film with a blower fan to maintain a pillow of insulating air between them. This setup actually provides some of the best insulation possible. Light transmission levels are normally in the high 80’s% range for a single layer of clear poly film. White opaque poly film is a good option for growers in really bright and/or tropical locations. Light transmission for the white poly film is about 55%. Polycarbonate panels are the rigid greenhouse covering of choice for many greenhouse owners. Panels will last indefinitely though they will start to show signs of UV degradation after about 10 years. There are two main types of polycarbonate panels: single wall corrugated and multi-wall insulated. I typically don’t recommend single-wall panels except in areas and for applications where insulating value is of no consequence. The multi-wall panels are almost always going to be an advantageous choice. The multi-wall panels help with energy-efficiency whether your goal is to keep cool or keep warm. Light transmissions range throughout the 80% percent range. Glass is great! I love the feeling of being inside a perfectly transparent climate controlled greenspace. However, single pane glass is going to be hot in the summer and cold in the winter. The greenhouse frame will also need to be much more substantial to support the weight of all that heavy glass. Shipping costs also reflect the weight of glass. Many greenhouse growers choose glass despite its expense and fragility because it’s unique attributes are quite precious: Glass gives near 100% light transmission of all spectrums. Glass last forever and is not subject to degradation from ultraviolet rays. Last but not least is the huge aesthetic advantage of being in a glass structure.